Pesticide Application Methods is the standard work on the subject for all those involved in crop protection. This fully updated Fourth Edition takes account of the considerable changes in legislation, especially within the European Union, affecting some pesticides and how they can be applied. With greater emphasis now on protecting the environment, an additional chapter in this edition describes the importance of managing treatments to minimise spray drift, and the chapter on applying biopesticides has been updated, with the assistance of Paul Miller and Roy Bateman respectively. Basic information on the role of pesticides in integrated pest management is given with a discussion on the importance of defining the target and choice of spray spectrum to optimise delivery. The range of droplets and types of equipment for different methods of application, including seed treatment, are described with information on safe use and maintenance. 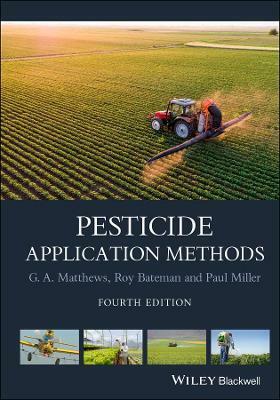 Pesticide Application Methods, 4th Edition, provides an essential reference for all those involved in crop protection, including entomologists, plant pathologists, weed scientists and agricultural engineers, whether researchers, consultants or those training in international, government or academic organisations, or the plant science industry. Libraries in all universities and research establishments where agricultural and biological sciences are studied or taught should have copies of this excellent new edition on their shelves. Pesticide Application Methods is the standard work on the subject for all those involved in crop protection. This fully updated Fourth Edition takes account of the considerable changes in legislation, especially within the European Union, affecting some pesticides and how they can be applied. With greater emphasis now on protecting the environment, an additional chapter in this edition describes the importance of managing treatments to minimise spray drift, and the chapter on applying biopesticides has been updated, with the assistance of Paul Miller and Roy Bateman respectively. Basic information on the role of pesticides in integrated pest management is given with a discussion on the importance of defining the target and choice of spray spectrum to optimise delivery. The range of droplets and types of equipment for different methods of application, including seed treatment, are described with information on safe use and maintenance. Graham A. Matthews is Emeritus Professor of Pest Management at Imperial College, UK. After his experience in developing integrated pest management of cotton pests in Africa, he led the International Pesticides Application Research Centre at Silwood Park, UK, and has travelled extensively as a consultant for international organisations and industry and to participate in training programmes. He has also been an advisor on application equipment for the World Health Organisation. Paul Miller is currently a Specialist Adviser with the Silsoe Spray Applications Unit, part of NIAB TAG and secretary to The Douglas Bomford Trust. He has been involved with crop spraying research and development since the early 1980 s when he led the Chemical Applications Group at Silsoe Research Institute prior to becoming Director of Technology at the Institute. He has worked on a wide range of crop spraying projects both nationally and internationally and particularly those concerned with sprayer controls and managing the risk of spray drift. Roy Bateman is a visiting Senior Lecturer at Imperial College and Harper Adams University (UK), and Nong Lam University (Viet Nam). With 35 years of experience in crop protection world-wide, he is currently a consultant on biopesticides and also specialises in pest management for cocoa industry and the International Cocoa Organisation. Previous work has included extension and research in tropical agriculture, with 12 years developing Green Muscle : a locust mycoinsecticide.